Is good news in store for the Foster family? Has The Fosters TV show been cancelled or renewed for a fifth season on Freeform? The television vulture is watching all the latest cancellation and renewal news, so this page is the place to track the status of The Fosters, season five. Bookmark it, or subscribe for the latest updates. Remember, the television vulture is watching your shows. Are you? 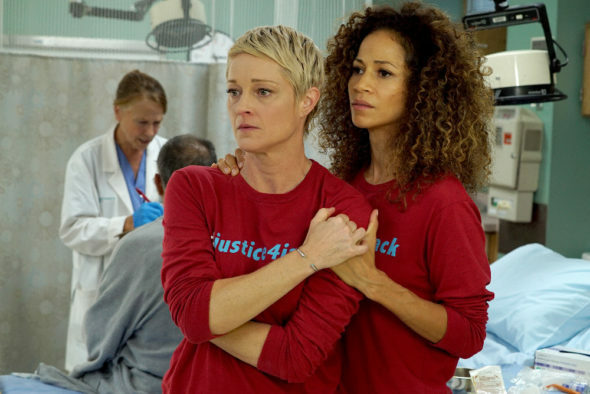 Airing on Freeform, The Fosters follows dedicated police officer, Stef Foster (Teri Polo), and school administrator, Lena Adams (Sherri Saum). An interracial lesbian couple, Stef and Lena are raising a blended family of foster, biological, and adopted kids, in San Diego. The TV show’s cast also includes Hayden Byerly, Noah Centineo, David Lambert, Maia Mitchell, Danny Nucci, and Cierra Ramirez. The fourth season of The Fosters averaged a 0.34 rating in the 18-49 demographic and 804,000 viewers. Compared to season three, that’s down by 16% in the demo and down by 20% in viewers. Learn how The Fosters stacks up against the other Freeform TV shows. On January 10, 2017, The Fosters was renewed for a fifth season. Season five premiered on July 11, 2017 at 8:00pm ET/PT. Since it is one of the cable channel’s stronger shows, it comes as little surprise that Freeform renewed The Fosters for a fifth season. One hundred episodes is a good sized package to sell in syndication. Still, I don’t think fans should be too surprised if season five ends up being the final season. Remember the fate of Switched at Birth. While its fourth season received higher ratings than current season averages for The Fosters, eventually, Freeform confirmed season five would spell the end of that family drama. We’ll have to wait and see how The Fosters’ story unfolds. TV show ratings are still important. Follow The Fosters’ weekly ups and downs. Check the rankings for all of Freeform’s TV shows. Find more news about The Fosters TV series or other Freeform TV show news. What do you think? Are you glad The Fosters TV show has been renewed for a fifth season? How would you feel if Freeform had cancelled this TV show, instead? Love the show kids are great moms are great. Would like to see Rosie O come back many more seasons here here! If only we could watch the fosters with Hulu like before . I bet rating would be up. So happy the fosters have been renewed I haven’t liked a show this much since the premiere of greys anatomy. Amazing actresses and the chemistry between them is amazing. Love the storylines. Keep the shows coming!! So HAPPY ITS RENEWED. I have Traumatic Brain injury too no one understands how hard it is. PLZ DON’T CANCEL YOU ALWAYS CANCEL THE GOOD FAMILY SHOWS ITS SO SAD. I am VERY HAPPY that The Fosters has been renewed. This show is very real – it deals with things that are very prevalent in our time. Very well acted. I LOVE this show. We have followed this show from the beginning. As a guilty pleasure, it held our interest. But when the show returned this week, it was say too over the op for us. It’s like everyone was a jerk, or stupid – all at once!